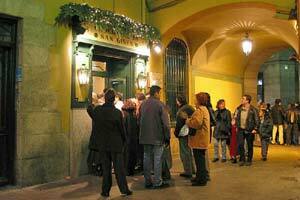 ABOVE: Evening brings crowds of hot-chocolate and churros fans to the Chocolatería San Ginés in Madrid. For fighting off hunger pangs in the long hours before a 10 or 11 pm. dinner, it's hard to beat the Madrileños' classic combo of hot chocolate with churros (a light, crisp Spanish doughnut that is often imitated but seldom matched by Mexican restaurants and fast-food chains). And for what may be the best hot chocolate and churros in Madrid, the place to go is the Chocolatería San Ginés, which is just off the Calle Arenal's pedestrian zone west of the Puerta del Sol. The Chocolatería San Ginés has been around since 1894, and it looks about the same as it must have appeared on its opening day more than a century ago. Pretty young waitresses serve cups of thick, sweet chocolate at the marble bar or at small tables amid the green wood paneling and mirrors of the 19th Century café. Churros arrive through a kitchen portal as long spirals of extruded and quickly-fried dough that the waitresses cut to length with scissors before serving. If chocolate and churros don't float your barco, you can fall back on coffee and cake--but you could have those at a pastry shop such as La Mallorquina (not far away at the Puerta del Sol). So put your faith in San Ginés, whose church is just around the corner, and go with the real deal. Also, if you're on a budget, don't let the café's upscale look put you off: At the bar, I paid only a few euros for a big cup of hot chocolate and a plateful of ready-to-dunk churros during a recent visit. How to get there: The Chocolatería San Ginés is at Pasadizo de San Gines 5 in the city center. From the pedestrian zone of the Calle Arenal, look for a secondhand-book stall next to the San Ginés church, turn into the side street, and the chocolatería will be just ahead. From the Calle Mayor, look for the Pasadizo de San Ginés right across the street from the Plaza Mayor's underground garage entrance. When to come: The Chocolatería San Ginés is open in the afternoon and at night. If you enjoyed your late-afternoon snack, you can return after an evening of tapas and tippling for another round of chocolate and churros or just for a coffee on the way back to your hotel. Churros photo copyright © Fundación Destino Madrid.